Authorities in Tennessee are investigating the shooting death of a man by sheriff's deputies after he reportedly twice tried to strike deputies with his vehicle, reports KTLA. Rodney James Hess, 36, of New Orleans was streaming on Facebook Live when he was shot Thursday afternoon. Hess' video does not show the officers shooting. Crockett County, TN, sheriff's deputies approached his sport utility vehicle because it was parked at a perpendicular angle along Highway 412 near the west Tennessee town of Alamo, TBI spokesman Josh DeVine said in a statement. Officers reported that Hess refused officer commands, made erratic statements, and tried to strike officers at least twice with his vehicle, DeVine said. Hess' nearly 20-minute-long Facebook video shows him acting oddly before the incident. His fiancée said he suffered from bipolar disorder. 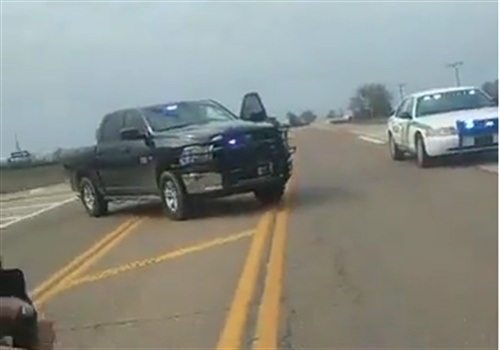 "During the escalation of events, at least one Crockett County deputy fired his service weapon through the front windshield of the vehicle driven by Hess, striking him," DeVine said. "At this time, we do not believe Hess used a firearm in connection to this incident." Hess died after being airlifted to a hospital in Memphis, about 80 miles southwest of Alamo. No law enforcement officers were hurt, the TBI statement said.